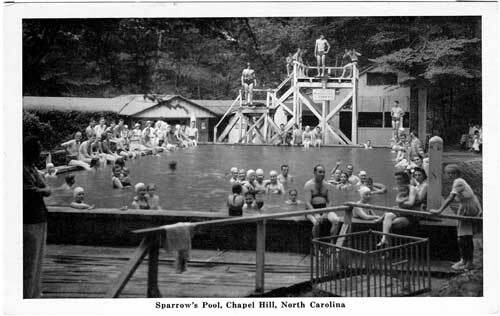 Tucked away in the hills off South Greensboro Street, down a dirt path and across a wooden bridge over a creek, sits an old empty swimming pool.Dappling sunlight comes through the thick canopy of trees, and the echo of the chatter of Carrboro youth of years past is almost audible. The property at 116 Old Pittsboro Road – the house atop the hill keeping watch, a meandering stone wall and the old Sparrow Pool – is magical. 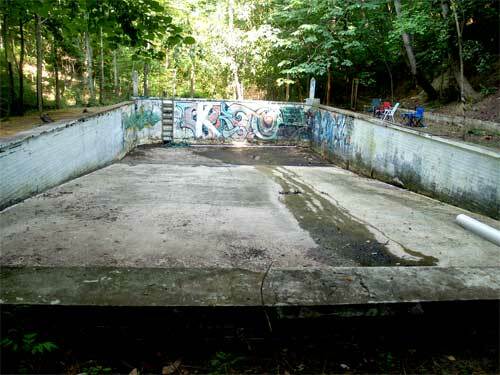 The shadows cast on the old cement-sloped swimming pool suggest ghosts of those who once bathed here. A couple of weeks ago, a group of old friends and former neighbors, some of whom had not seen one another for years, got together at their old gathering place. They caught up with each other, shared old stories and wandered around the place where they used to spend so many lazy summer days. 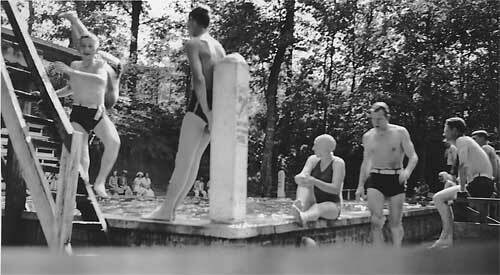 The nostalgia in their voices was evident as they recalled their adventures at Sparrow’s Pool. Jane and Logan Kendall bought the 10.5-acre property about a year and a half ago. They have since lovingly restored the old house and now are digging pieces of history from the land surrounding it. They spent months tracking down those who used to swim in the pool and pass Saturday nights in the dance hall, then sent out an invitation – using a 90-year-old advertisement announcing the pool’s opening – to a party. “Hello summer, goodbye cold. 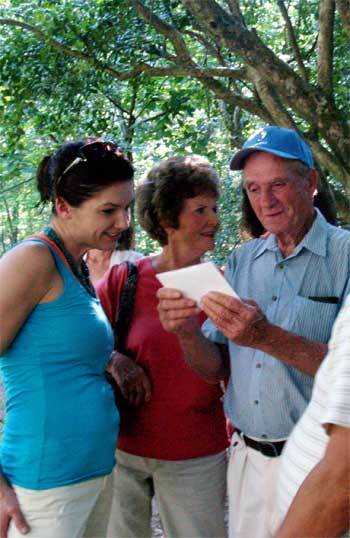 Come join us with friends, family, and tales of old,” the invitation read. Joseph Sparrow and his wife, Mattie Sparrow, known to the community as “Mrs. 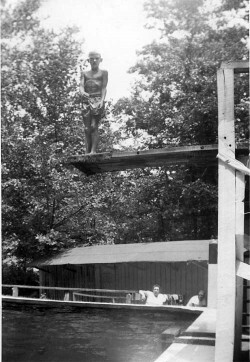 Bob,” built the pool down the hill from their Carrboro home at the end of World War I. They opened it to the public and charged admission, and it quickly became a popular hangout for those hoping to escape the summer heat. “The swimming pool in Carrboro will open day after tomorrow, Saturday, May 5. On that day all who bring their own bathing suits may use the pool without charge. We now get filtered water from the University, and it is changed frequently. We have a new spring board, a new diving stand, and a new cement walk around the pool. There are two shower baths for men and one for women. The flier also notes that wool bathing suits could be rented for 25 cents, cotton for 15 cents. The pool remained open until 1958, when it became too much for Mattie Sparrow to manage after her husband died in 1955. In 1961, she moved to Pine Street and sold the house to the Bost family, who used the pool just for family and friends. The property changed hands several more times over the years. Before the Kendalls bought it, it was rented to the Carrboro Greenspace Collective, which showed movies in the pool and housed members in the old Sparrow home. After renovating their new home, the Kendalls wanted to hold an event that would serve not only as a housewarming party but as an occasion to reunite the pool’s former regulars, though the pool remains empty. “It just meant a lot to the community,” Jane Kendall said. She tracked down Lawrence McAdams, whose mother was best friends with Bob Sparrow and who spent countless hours in the swimming pool. McAdams helped her locate other Sparrow Pool regulars, including Glenn Michael “Micky” Sparrow, Joseph Sparrow’s grandson. Taylor and his brother Hubert were in charge of mowing the grass, watching over the pool and keeping everyone in line. Some evenings, the parking area would get so full that Taylor had to go up the hill to move cars around to allow people to get in and out. “We kept it open as long as there were people here,” he said. Taylor now lives in Randleman, but traveled back to Carrboro to reunite with old friends and swap recollections. “This brings back some good memories,” said Sandy Lloyd, who spent many happy days around the old property. Lloyd lived up the hill from the pool in his youth and still lives in Carrboro. “Well, this was the only place that you had to go,” he said. Lloyd told stories of sneaking around the property stealing watermelons grown by the Sparrows and teasing women who swam at the pool. “If some of the women were to come down here on Sunday afternoon and swim in Sparrow’s pool, they wouldn’t let them go to church the next Sunday,” Lloyd said. 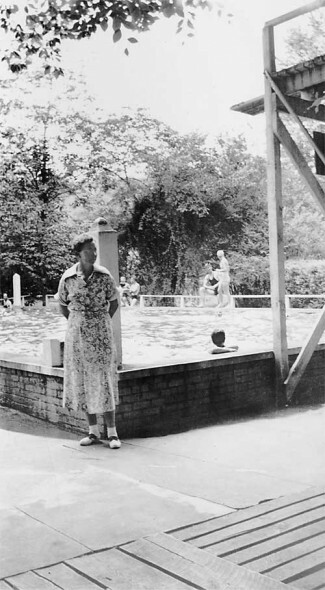 Pearl Maynor said she only visited the pool a few times, but that her husband used to hang out there. “I’ve sure heard some tales about it,” she said. “There wasn’t much else to do in Carrboro back then. Because the pool is far from meeting today’s standards and regulations, the Kendalls aren’t sure whether they’ll be able to restore it for swimming. Regardless, they want to restore the property in some way, and possibly use it as an educational space for kids to learn about the environment or other topics. Despite the obstacles, Jane Kendall said she hopes she’ll be able to use the pool for swimming, and wants the party to become an annual event. Great article. I wrote a piece on this in the CH News a month ago, but this really does it justice. Logan and Jane are wonderful people, and they had to overcome some opposition by a small group who abused and vandalized the place, exploiting the notion of “usufruct” as a shield for their irresponsible behavior. The Kendalls have been wonderful stewards of this property, and I am grateful to have them as neighbors. I used to work for Louise Bost who lived in the house that adjoined the pool. She and her family still used the pool while they lived there. She said the concession stands were still there. Louise was the founder of the Oncology Recreation Therapy Program at Duke Medical Center. I have not spoken to her in many years.